I'm really enjoying my current WIP's, they're all knitting projects at the moment although I'm starting to plan my next crochet project for when I've finished one of these. First up is my rainbow socks, I'm just knitting until I get to the end of the yarn. I'll probably start the cuff once I get to the red section. The yarn is from Mothy and the Squid on etsy. I've tweaked the colours a little as my camera washed them out but they're really bright and saturated in real life. Lastly we have my first attempt at designing my own pattern. I'm using the Incredible Custom Fit Raglan as the basis for the pattern. The cable is from here and I'm planning a shawl collar. As you can see I've recently separated the arms off so it's progressing much faster now. Currently it's in time out though after I had to perform some surgery on the cable. I'd missed a cross over 4 rows back so had to drop the stitches down, rearrange them and then use a crochet hook to bring them back up. This sweater is destined for Mr Soaring Sheep, I work on it when he's away with work during the week and then he gets made to try it on to check the fit at the weekend. Poor boy lol. Love your rainbow socks. They make me smile. Oh it must be so exciting to be designing your own pattern! What a thrill designing your own pattern it looks amazing. I love the rainbow socks, a real feast for the eyes. beautiful knits on the needles and you've been quite productive!! Love the sock colorway. What great projects! Your sweater is coming out great. You are so talented! AMAZING rainbow socks. I really love the pattern of that other pair. :) Gorgeous projects! Wonderful projects and what a collection of stunning colours! Love them! love, love your socks. I am not at that level yet with my knitting as I am a beginner. By the way you would love the book I mentioned on my blog post. Thanks for commenting on my blog. 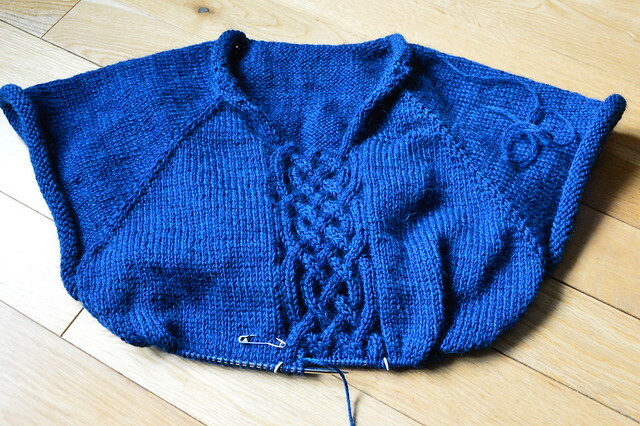 Wow, the sweater is coming along marvellously! I too love the socks! You go, cable surgeon. I would have no clue on where the cable crosses. That blue is so electric. 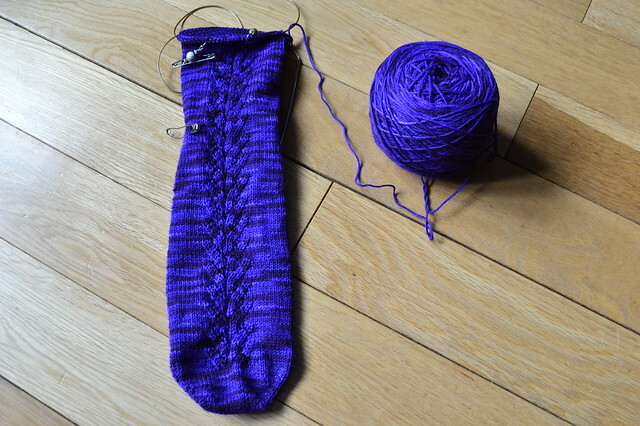 I think it's smart to knit two at a time socks. One wouldn't have to keep weighing yarn or even trying to halve the skein. You have some beautiful projects in the works. I love those rainbow socks. I'm knitting rainbow socks too!! My colors aren't as saturated as yours are but I'm excited and can't wait to see what they look like when Done. I love your pattern you are making, beautiful. I love the blue socks. And the blue sweater. Gorgeous! 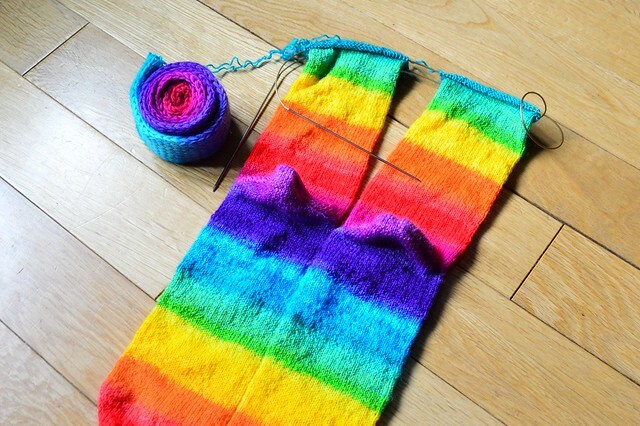 And the rainbow socks look like a lot of fun (both to knit and to wear). So pretty projects! I love the rainbow socks ♥. Sunny greetings & happy weekend!